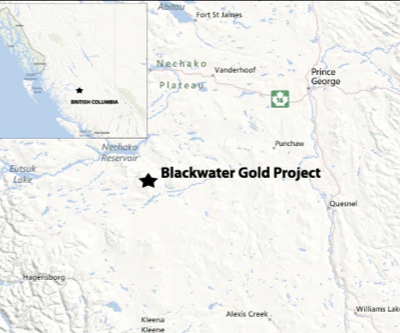 The Canadian Environmental Assessment Agency is requesting local people to send their opinions on the Blackwater project, New Gold Inc.’s proposed mine in British Columbia. The Toronto-based firm is planning the construction, operation and decommissioning of an open pit gold and silver mine, located approximately 100 kilometres south of Vanderhoof, B.C. The project would produce 60,000 tonnes of gold and silver ore per day over a mine life of 17 years. The Canadian Environmental Assessment Agency is seeking public comment on what’s been dubbed the Blackwater Gold Project. Comments can be made on which aspects of the environment may be affected by this project and what should be examined during the environmental assessment. The public can review and comment on the draft Environmental Impact Statement (EIS) Guidelines, a document that identifies the potential environmental effects to be taken into consideration and the information and analysis that needs to be included in the proponent’s EIS. To view the draft EIS Guidelines or for more information, visit the agency’s website (registry reference number 80017). The agency warned that all comments received will be considered public. New Gold Inc. holds the Mesquite gold mine in California; Cerro San Pedro gold-silver mine in Mexico; Peak gold-copper mine in Australia; the New Afton copper-gold mine, and projects in British Columbia and Chile.